Bring compact connectivity back to your USB-C equipped computer. The USB-C Travel Dock brings compact and portable connectivity to your Mac and PC, and up to 60W pass through power. 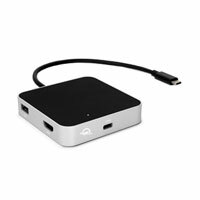 The USB-C Travel Dock lets you connect to your notebook, drive and HD display, connect, power or charge up to two USB devices and access photos from your camera's SD card.